The Magicard Pronto ID Card Printer is built to issue high-quality cards and badges on the spot. Compact and affordable, this single-sided single-feed printer is perfect for small and medium businesses in need of a flexible solution for secure card issuance. Loaded with innovative features, the Magicard Pronto ID Card Printer is designed to meet the requirements of a wide range of applications such as employee IDs, student IDs, membership cards or loyalty cards. Used with rewritable cards, the Pronto can erase and print on the same card to create visitor or temporary badges. The Magicard Pronto ID Card Printer benefits from Magicard�s exclusive HoloKote system to apply a secure holographic watermark across each printed card at no additional cost. The low-cost single-feed Magicard Pronto ID Card Printer produces personalized single-sided cards on demand in moments, and features edge-to-edge quality, magnetic-strip encoder, rewritable cards, and a built-in HoloKote anti-counterfeiting watermark for visual security�a great tool for small businesses or institutions that need corporate IDs, student cards, visitor badges, and loyalty cards. WHAT ARE THE MAIN SPECIFICATIONS OF THE MAGICARD PRONTO ID CARD PRINTER? WHAT ARE THE HOLOKOTE AND HOLOPATCH FEATURES? The Magicard Pronto ID card printer comes with unique visual security features for highly-secure badges. The specificity of these tools is that they are printed with Magicard standard consumables, which means that there is no additional cost for you. HoloKote�: available with all Magicard ID card printers, this patented tool prints secure watermarks into the overlay panel of your printed cards. The HoloKote� watermark becomes visible when the card is tilted for maximum security. You have the choice between four different patterns printed repeatedly across your card. HoloPatch�: HoloPatch� is another exclusive feature to Magicard and consists of applying a highly reflective gold patch on the top right corner of your cards. The logo of one of your HoloKote security watermarks becomes clearly visible when you view your cards at an angle. It also helps authenticate your cards from a distance. CAN I STORE DATA ON MY CARDS WITH A MAGICARD PRONTO ID CARD PRINTER? The answer is yes. The easiest � and most inexpensive � way to add data is through barcodes. No need for a specific encoder: all you have to do is add a barcode in the design of your cards through your software. Optional magnetic encoding is available with the Magicard Pronto ID card printer to personalize cards with a magnetic stripe. Widely used in access control and time & attendance, magnetic cards are an affordable choice for multi-feature badges. 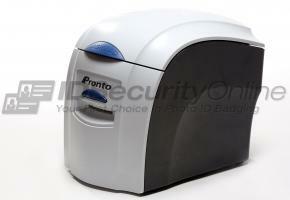 If you need more secure badges, add a smart card encoder to your Pronto ID card printer. With contact and contactless smart cards, the data is securely encoded into an embedded chip. To store data and to be read, a contact smart card must be inserted into a reader, when contactless smart cards only need to be waved within range of a reader.